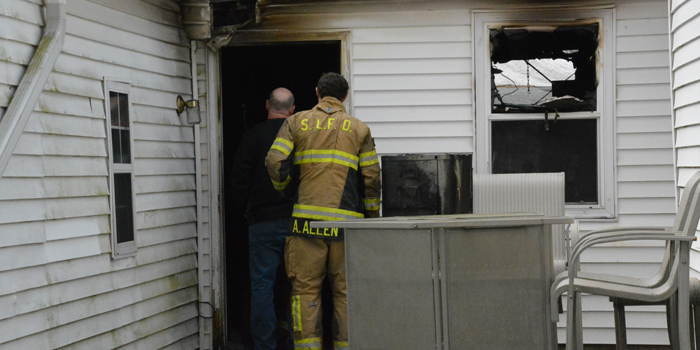 A Silver Lake Fire Department firefighter observes the damage at 506 E. Sycamore St.
SILVER LAKE — Firefighters from the Silver Lake Fire Department responded to a one-story house fire at 506 E. Sycamore St. The fire occurred before noon this morning, Feb. 28. Ashley Trusty, a resident of the building, said that no one was in the house when the fire occurred. The fire started in the part of the residence connecting the garage to the house. Damages are up to $20,000. Silver Lake Fire Department was assisted at the scene by Claypool Fire Department and Sidney Fire Department.